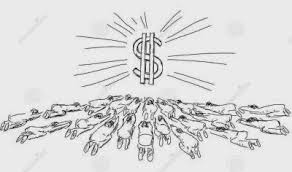 I was asked to give my thoughts on this quote, “The worship of the ancient golden calf has returned in a new and rude disguise in the idolatry of money.” I went on somewhat of a rant about how money is more important than human life. How poor people are often seen as less human. How they are seen as lazy or worthless, but most times are the hardest workers out there and struggle through the worst of hardships. As I reflect I realize that I really didn’t answer the question. It was answered for me. The next question Msgr. got us thinking about was, “The dignity of each human person and the pursuit of the common good are concerns which ought to shape all economic policies.” Do these concerns shape economic policies? If not, what does? The piloto, Dennis Shannon said no, currently they don’t. He went on to say that this was a conversation that he has had with many people and there are many different perspectives on how our economy should work. The way our economy works now is based on money and revolves around profit. He asked “how can we create an economy that’s concerned with the common good and the dignity of each human person when we need money, without money our world can no longer function. Through reflection I realized that he actually answered the question I tried to answer. In his response was the answer to the question which I had just tried to answer before him in my off topic rant. That is the worship of the ancient sacred cow in disguise. I was trying to make the point that we put money over human life, but more than anything the idolatry of money is in the fact that we truly believe that we NEED money in order for our world to function. The belief that without money our world and the people in it could not continue or survive. I believe that this hoax is one of the greatest perils of mankind and it dominates our every thought and action in life. Once we are able to let go of this false idol, and only then, can we truly begin to create an economy that is based on “the dignity of each human person and the pursuit of the common good,” because the driving factor would no longer be profit, money, but rather human. I think this is an awesome topic…is there anything else you’ve read about this that you thought was a great read? I’d love to read about it 🙂 thanks for writing this!! This is a wonderful insight, Cesar! You – have looked into an assumption – and found the assumption to be false. You are that much closer to the truth! Thank you for this post.